How a website’s speed affects its ranking and how to improve it? It is really a bad experience for an internet user when he clicks on a website and it takes a long time in loading and when it happens again next time surely he will never come back to it. Google is now taking the load time into account in its website ranking algorithms as the slow loading of websites somehow affects its reputation. The long time in loading can result in less use of Google and the users will switch to the other search engines so Google will have to deal with less income from advertising. Sometimes back, an official blog post by Google made it clear that from the date they will consider the loading time of a page or a website while ranking it. The webmaster team of this leading search engine also confirmed that they have started to take action against the websites taking ages to load unless they take steps to improve it. This confirmation puts a serious impact on the website designers and webmasters and they are now showing a great interest in removing and controlling the loads from their web pages and sites. Eventually, apart from the many other websites ranking parameters such as meta title and meta description, page load time is also an important factor that plays a game changer role in the websites’ Goole search ranking. The overall impact of this changed parameter for website ranking is a good move. While it will meet the Google guidelines, the faster loading will facilitate the users to experience a better internet practice. A new blogger who is not aware of this condition is at the risk of missing their potential search engine ranking because of this. An intelligent and aware web technician must check the load time of his sire in a regular manner and take necessary steps to maintain it. 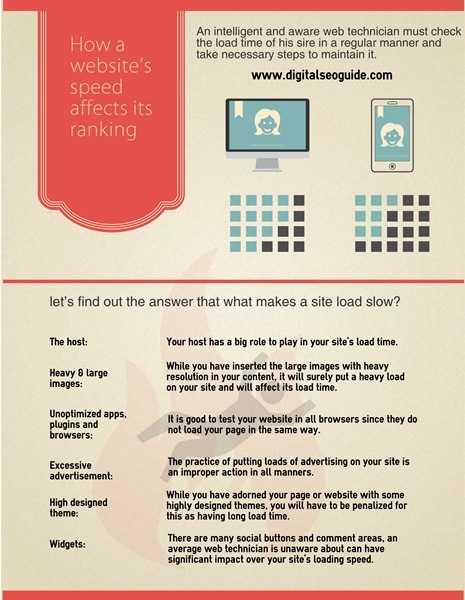 But first, let’s find out the answer that what makes a website load slow? Your host has a big role to play in your website’s load time. Many web technicians pick the cheap offers and pay or this in a long run. So having a right host that can fit in your size and ensure a good speed is the smart decision. We have also shared Amazing WordPress Themes and Top Web Hosting services which you must check out. While you have inserted the large images with heavy resolution in your content, it will surely put a heavy load on your website and will affect its load time adversely. The other reason can be extra data in the or of comments or lack of compression. As possible use the PNG format images instead of JPEG images. The application of external media such as videos can impressively complement your content, but on the other hand, they can be a reason for the less speed in loading. If you want to gain some load time, you should go with hosting the videos on your own server. It is good to test your website in all browsers since they do not load your page in the same way. And also, if you are using Flash or the similar apps, there is a serious problem of less speed in loading with your website. The practice of putting loads of advertising on your website is an improper action in all manners. One side it bothers and irritates your visitors and on the other side, it slows down the page speed. While you have adorned your page or website with some highly designed themes, you will have to be penalized for this as having a long load time. There are many social buttons and comment areas, an average web technician is unaware about can have a significant impact on your website’s loading speed. Your website’s loading speed is also getting affected due to your HTML/CSS if they are not efficient enough. As the best way to speed up your website, it can save up to 60% of bandwidth and have many requests your website makes. It hosts the files across a large network of servers around the globe. Due to superb bandwidth spread to various servers, there is a low possibility of heavy load on servers as well as the attack of DDoS attack and traffic spikes. When you are working with WordPress, you are advised to install some great caching plugins like WP Total Cache or WP Super Cache which are absolutely free to download and also the quick and easy ways to cut the page loading speed. And, if you are not working with WordPress, or don’t have any other plugin for the purpose of adding Expires Headers and browser caching, you need to do it manually. Just go to the related page and follow the guidelines given here. There are two ways that the expire headers speed up a website’s loading speed. First, the users need not download the same file from the web server twice and second, there is a reduced amount of HTTP requests; as a result, the page loading speed improves automatically. It is a preventive or strategical step before the problem really arises. When you have opted a good host and a good CDN now it is the time to choose a good design or theme for your website. It should look nice and also perform decently in the speed perspective. Here the smart use of WordPress is very useful which facilitate with many bells and whistles and usually they take only 10 seconds to load. With the routine working with WordPress, your system often experiences a very messy database due to saved drafts, post revisions, deactivated the plugin and many other things. You need to use some cleaning plugins (such as WP-Optimize) for deleting all the unwanted stuff to get rid of this cluttering material. One of the pitfalls with WordPress is that your database can get very messy very quickly due to saved drafts, post revisions, deactivated plugins, etc. WP-Optimize is a fantastic plugin that routinely deletes all of the stuff you don’t need that’s cluttering up your database. It not only improves the website loading speed but also facilitates a browser by reducing the time required for collecting and returning files from the database.